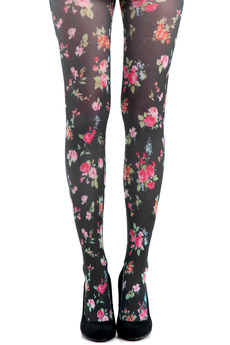 Pamela Mann Ditsy floral printed tights.The perfect floral pair, is smart, pretty and ditsy. This design features delicate pink floral detail. All printed tights are produced by hand, this process results in a completely unique pair each and every time. One size, fits Small, Medium and Large. Composition: 95% Nylon, 5% Elastane. Color: Black.